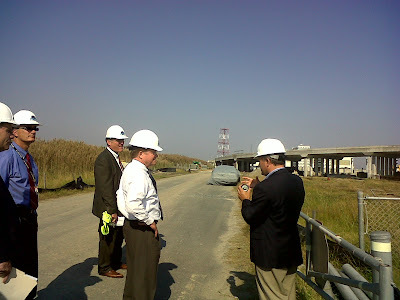 U.S. Sen. Jim Webb (center) on Tuesday made his first official visit to the NASA Wallops Flight Facility and Mid-Atlantic Regional Spaceport on Wallops Island, Va. Orbital Sciences Corporation is slated to launch the first Taurus-2 rocket to orbit from the commercial spaceport next summer. Thereafter, the Taurus-2 will launch about every six months carrying cargo to the International Space Station. Webb was joined by his chief-of-staff Paul Reagan. Construction of a new launch pad on Wallops Island is proceeding with completion targeted for spring 2011 and the first launch in summer 2011 following the first in-place test firing of the orbital booster. Meanwhile, Bigelow Aerospace continues to review the site as a potential future launch site for the UAL Atlas-V to carry humans to a Bigelow private space station around mid-decade, according to attorney Mike Gold.